Iceland has pledged to remove palm oil from all of its own-label foods amid concerns huge swathes of tropical rainforests in South East Asia are being destroyed for its production. The impact on global climate and wildlife has prompted industry efforts to promote "sustainable" palm oil which is not environmentally damaging. But Iceland managing director Richard Walker said the company did not believe there was verifiably sustainable palm oil on the mass market and so would remove it altogether.Palm oil is found in more than half of all supermarket products from biscuits, breakfast cereals and chocolate to soap.But a survey of 5,000 people commissioned by the supermarket found 35% of consumers are unaware of what it is.After being informed about palm oil and its effects on the environment, 85% said it should not be used in food products.Iceland will be removing the product from 130 of its food lines, which will reduce demand by more than 500 tonnes per year, it said.It has already been replaced with alternatives such as sunflower oil and butter in half of them. The company told Sky News other branded goods that contain palm oil would remain on its supermarket shelves.Mr Walker said: "Until Iceland can guarantee palm oil is not causing rainforest destruction, we are simply saying 'no to palm oil'. "We don't believe there is such a thing as verifiably 'sustainable' palm oil available in the mass market, so we are giving consumers a choice for the first time. "Having recently been to Indonesia and seen the environmental devastation caused by expanding palm oil production first hand, I feel passionately about the importance of raising awareness of this issue - and I know many British consumers share my concern and want to have a real choice about what they buy. "This journey has shown me that, currently, no major supermarket or food manufacturer can substantiate any claim that the palm oil they use is truly sustainable, as the damage being caused to the global environment and communities in South East Asia is just too extensive. 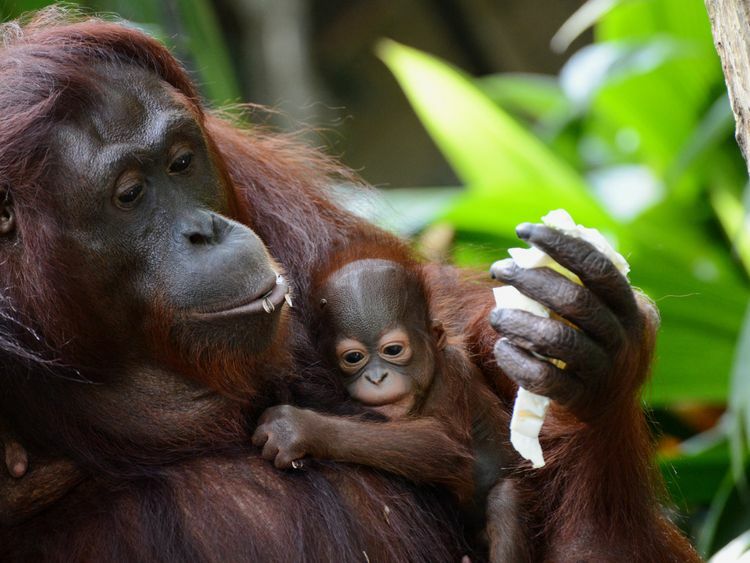 "A study published in the journal Current Biology earlier this year found that the population of Bornean orangutans had fallen by 100,000 between 1999 and 2015 due to logging, deforestation or industrialised plantations.Acccording to the World Wildlife Fund, the species' habitat has been reduced by at least 55% over the past 20 years. Greenpeace UK executive director John Sauven said Iceland's move was a direct response to the palm oil industry's "failure to clean up its act".He said: "As global temperatures rise from burning forests, and populations of endangered species continue to dwindle, companies using agricultural commodities like palm oil will come under increasing pressure to clean up their supply chains. 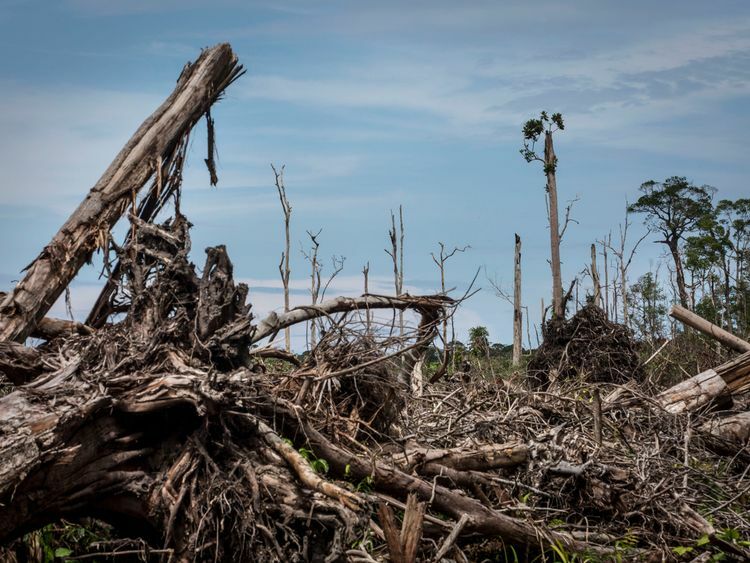 "Many of the biggest consumer companies in the world have promised to end their role in deforestation by 2020. "Time is running out not just for these household brands but for the wildlife, the climate and everyone who depends on healthy forests for their survival. "In January, Iceland revealed it had developed paper and pulp alternatives for 1,000 of its lines and planned to remove plastic from its own brands within five years.